Anthony Santiago as John Wheelwright and Chris Lam as Owen Meany in the Ensemble Theatre Company production of A Prayer for Owen Meany. Photo by Javier R. Sotres. John Irving once stated he had doubts his novel A Prayer for Owen Meany could ever be turned into a movie. 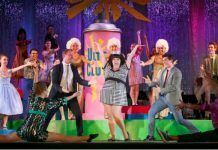 But film and stage are two different beasts, and while the silver screen may not be able to contain this epic tale, Simon Bent has distilled Irving’s book into a quirky, touching and oddly entertaining piece of theatre. 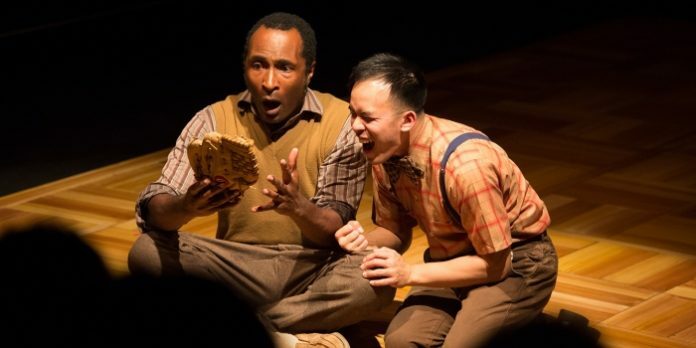 Much of the success of the Ensemble Theatre Company production, playing at the Jericho Arts Centre this summer in repertory with In the Next Room and Master Class, is due to the performances from Chris Lam and Anthony Santiago. Lam is particularly good here as the diminutive Meany. This is no easy feat for a character with a “wrecked voice”, yet Lam manages to sustain a high-pitched childlike speaking style through the play’s entire two and half hours. While the odd vocalization required of the role could easily devolve into caricature, Lam skillfully handles it though his natural delivery and in capturing the wry humour of his character. Mercifully he avoids shouting his dialogue which, for those unfamiliar with the book, Irving indicated using upper case. Santiago is also successful in finding the reality of his character within the oddities of Bent’s adaptation. Easily flipping between childhood friend and narrator looking back, Santiago helps to bring some clarity to Meany’s peculiar story. There is a genuine connection between the two which also helps. Alexis Kellum-Creer and Adam Beauchesne in A Prayer for Owen Meany. Photo by Javier R. Sotres. Other standouts include a radiant Alexis Kellum-Creer as Tabitha Wheelwright, whose ultimate demise created gasps from the audience. Adam Beauchesne is wonderfully understated as Tabitha’s husband-to-be, giving one of the most touching moments of the play as he is introduced to his young step-son. David Wallace finds the idiosyncrasies in Reverend Merrill, and Gabriel Carter and Kim Steger are hilariously deadpan as Owen’s equally odd parents, constantly showered by dust from the quarry blasts next to their home. Sometimes less really can mean more though, as there are a few inconsistencies from some in this very large cast. While much of the more mannered acting may be explained as coming from larger-than-life characters existing in John’s memories, it is sometimes uneven and starkly contrasting. The devout may also find some of the commentary on belief and faith off-putting. Pulling few punches, through Owen’s sometimes subversive, and often very funny view, it does hold a mirror to some of organized religion’s peculiarities and contradictions. Director Ian Farthing reinforces the religious themes, taking every opportunity to insert the imagery necessary to give credence to the wild possibility Owen is the second coming of Jesus Christ. Beyond its odd story of the diminutive Christ-like figure though, what ultimately makes A Prayer for Owen Meany so compelling is how many of the historical events depicted as Owen grows up through the fifties and sixties, can be viewed from a modern lens. With a sometime equally scathing commentary on the American zeitgeist of the time, including John F Kennedy’s philandering, the Vietnam War and the polarization of modern politics, it is evident we have not learned from the past. Lauchlin Johnston’s set design is simple, with an oversized chair at its centre. With Owen perched on top, he is swallowed by its sheer size, giving the illusion he is much smaller than he is. Patrick J Smith’s lighting helps immensely to move from narration to real-time, and in defining the various locations. Karina Pry’s sound design is, perhaps ironically, film-like and Julie White has some great fun with the period costumes. While this production of The Prayer for Owen Meany was immensely enjoyable, it was also tough going in the second act. 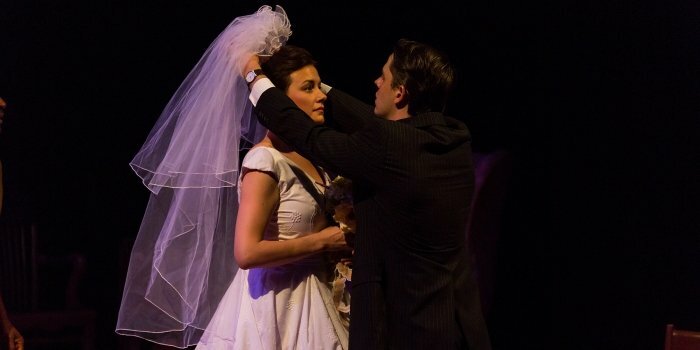 Not because it was inferior to its first, but because the heat inside the Jericho Arts Centre became almost unbearable. The result was often, and frustratingly, being pulled out of the story as the temperature inched higher. A Prayer for Owen Meany by Simon Bent. Adapted from the novel by John Irving. Directed by Ian Farthing. An Ensemble Theatre Company Production. On stage at the Jericho Arts Centre (1675 Discovery St, Vancouver), playing in repertory with In the Next Room and Master Class until August 18. Visit http://ensembletheatrecompany.ca for tickets and information.